The lighting is dim, the tablecloths are white, the waiters are wearing black vests, and a fireplace sets the mood at this legendary restaurant, which was focusing on local and sustainable ingredients before anyone coined the phrase "locavore." 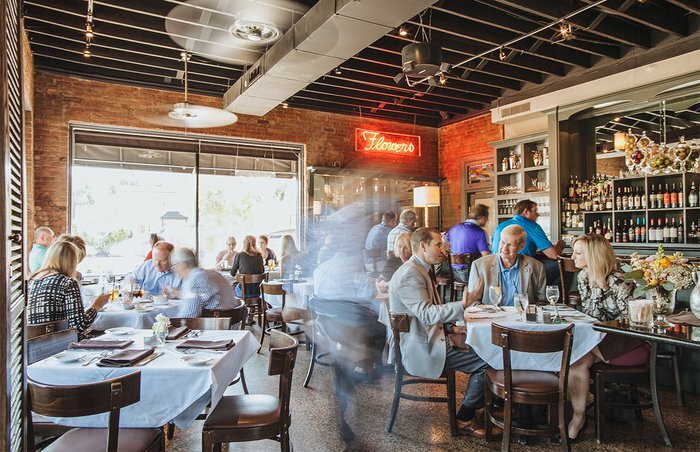 Highlands Bar & Grill put the Birmingham, Alabama, dining scene on the map when it opened in 1982, and chef and co-owner Frank Stitt (who runs Highlands with his wife, Pardis) has already been inducted into the James Beard Foundation's Who's Who of Food & Beverage. 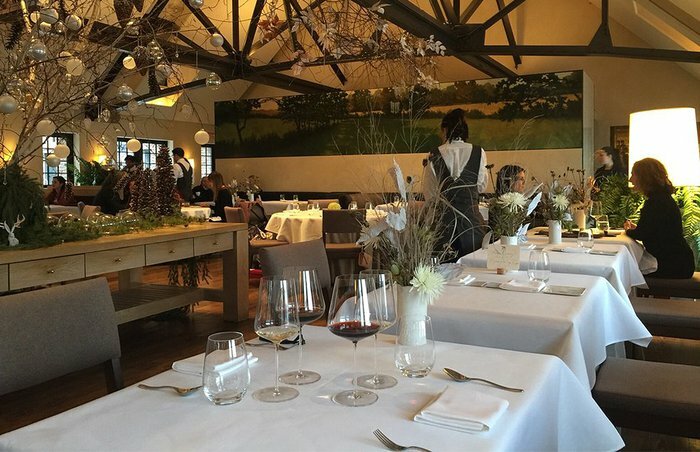 The restaurant has been nominated for Outstanding Restaurant seven times. What to expect from a meal at Highlands? It's sometimes best to hear it straight from the source: "We serve a daily changing menu informed by classic French technique, incorporating the foods of our Southern region." 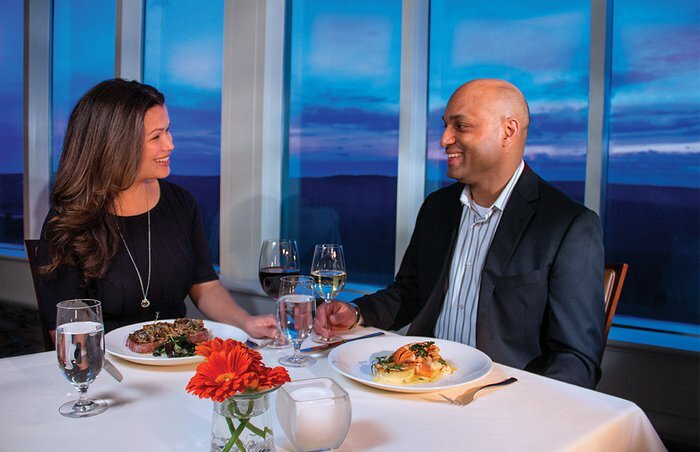 Upscale, discreet, classy, and located in the luxurious Hotel Captain Cook in Anchorage, Alaska, Crow's Nest offers 360-degree views and a high-end menu from chef Reuben Gerber. It's a AAA four-diamond restaurant with plenty of dark woods and a 10,000 bottle wine list, and the menu is positively luxurious: Indulge in foie gras with pistachio, gooseberries, apricots, and fruit coulis; a daily risotto; Alaska king crab bisque with sherry gelée; prime beef rib-eye with roasted broccolini and bordelaise; and duck breast with porcini duxelles, Parisian gnocchi, duck pancetta, spruce tip salt, and crowberry gastrique. Candlelight dining alfresco alongside a babbling creek lined with cottonwood and sycamore trees? Sounds romantic to us! 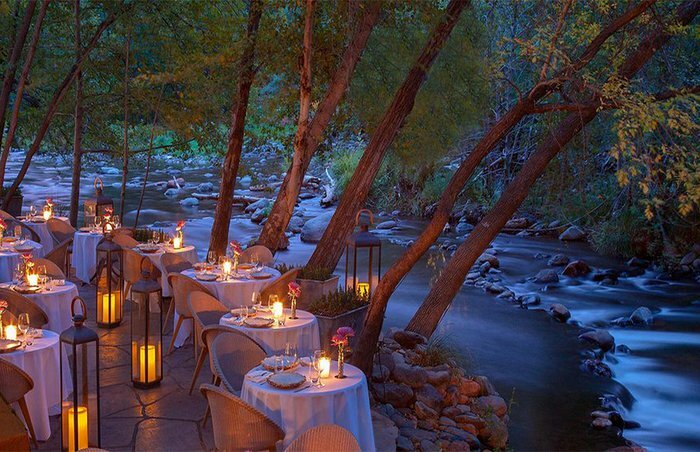 At Cress on Oak Creek, located in the upscale L'Auberge de Sedona in Arizona, even the interior tables - with their white tablecloths and flower vases - are romantic, but the outdoor tables overlooking the creek really are something else. 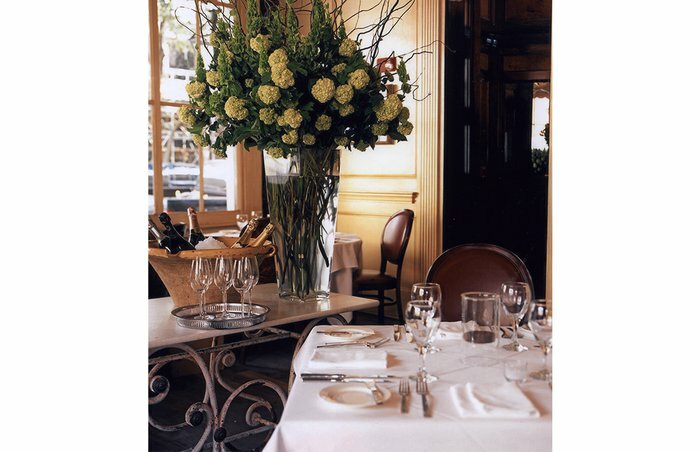 The restaurant offers only fresh, seasonal ingredients, in three-, four-, or six-course tasting menus. A serene and stylish white-tablecloth restaurant inside the Capital Hotel in Little Rock, Arkansas, One Eleven has hardwood floors, original artwork on the walls, and plenty of natural light; once the sun goes down, the romance factor is kicked up several notches. Executive chef Joël Antunes won a James Beard Award for Best Chef: Southeast in 2005 for his Atlanta restaurant Joël, and his culinary skills are on serious display here in dishes like cured and smoked pork loin with mostarda chutney; roast duck breast with duck tortellini and honey ginger sauce; grilled prime beef fillet with bordelaise; and seared diver scallops with shiitake mushrooms, potato gnocchi, and lemon beurre blanc. The wine list is also expertly curated. "Charming" is a word often used to describe the Little Door in Los Angeles, California, and that might be an understatement. Entering the (literal) little door to the storybook garden makes diners feel as if they've discovered their own special spot; indoors, eating by the fireplace is an inviting option. Start your meal with seared foie gras and a fried duck egg on baguette French toast, follow up with grilled filet mignon with green peppercorn and tarragon gastrique demi-glace, and wash it all down with a nice bottle of wine. 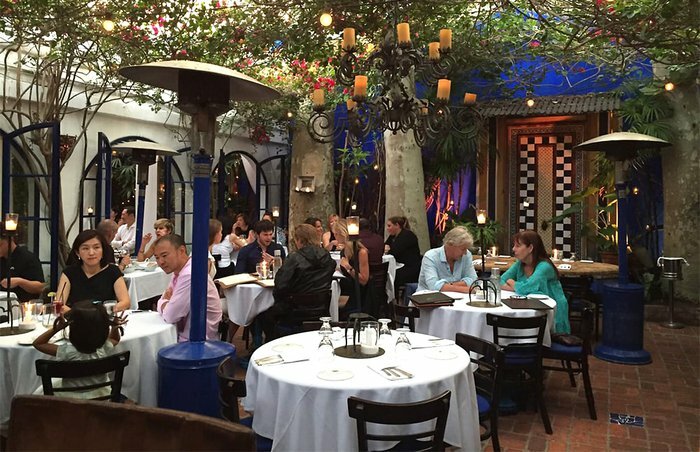 Sure, this place does bill itself "the most romantic restaurant in Los Angeles," but it's not a gimmick: This place really is that romantic. 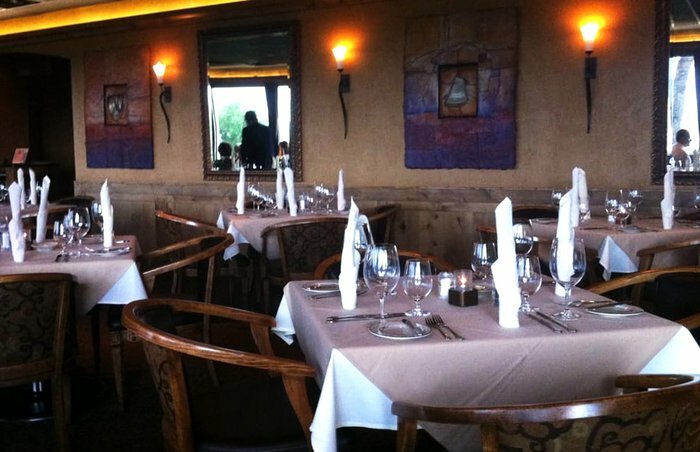 A Colorado Springs fine dining institution, Pepper Tree offers just about everything you look for in a romantic restaurant: Its hilltop perch affords stunning vistas of the city, tables are well-spaced and covered in white tablecloths, and, as icing on the cake, many dishes are also prepared tableside. They also serve quite possibly the most romantic dish around: Chateaubriand, a 16-ounce center-cut filet mignon with béarnaise and vegetables, prepared tableside, of course. 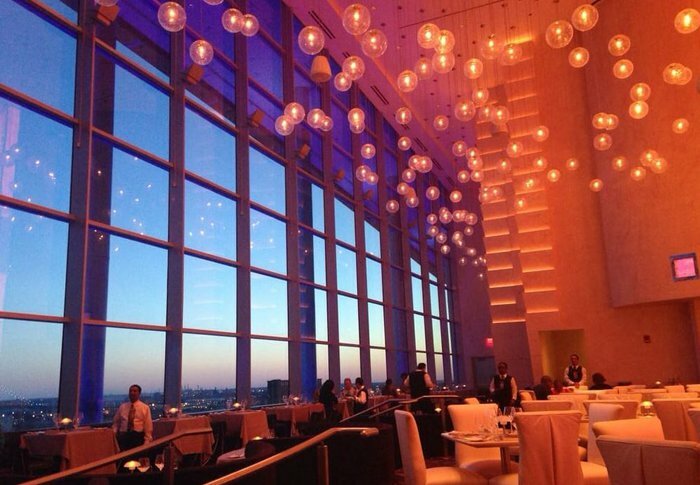 Vue24 is an upscale and very high-end restaurant perched on the 24th floor of Foxwoods' Grand Pequot Tower, and it's insanely romantic. Elegant and refined, with well-spaced tables, live piano music, incredible views from huge windows of woodland as far as the eye can see, and a high-end French-inspired menu. This is old-fashioned Continental dining at its finest: beef tartare, foie gras, escargot, shellfish towers, oysters, caviar, veal Oscar, tableside chateaubriand, steak Diane, USDA Prime rib-eye and New York strip. This Connecticut charmer is textbook romantic, and it executes that ambition perfectly. 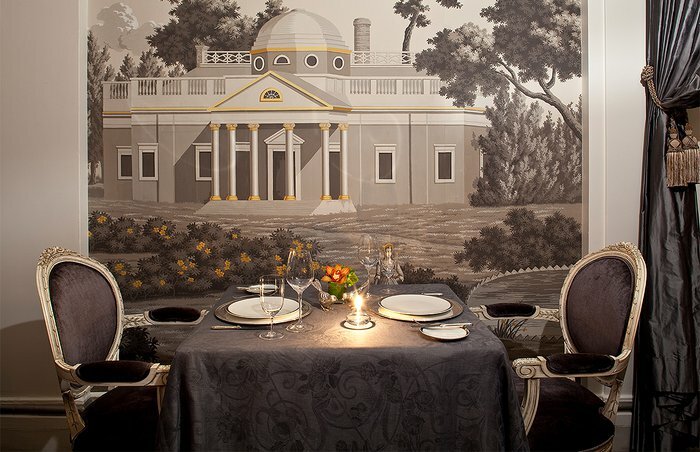 The Green Room, located inside the elegant Hotel Du Pont in Wilmington, Delaware, is about as romantic as a restaurant can get. The walls are oak-paneled, the ceiling is coffered and oak beamed, rich draperies hang from the windows, and lighting is provided by ornate chandeliers and sconces. 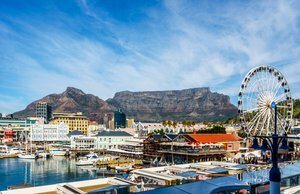 It's also been recognized with the AAA Four-Diamond Award and Forbes Four-Star Award. Even though it may be dripping with Gilded Age opulence, chef Keith Miller's menu is anything but staid. Standouts include pan-seared sea scallops with smoked blueberry purée and cheddar grits; grilled veal porterhouse with roasted garlic demi-glace, creamed fingerlings, and tri-color baby carrots; and fillet of salmon with red curry coconut cream sauce, forbidden rice, and local asparagus. 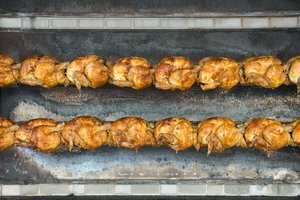 Known as the founding father of New World cuisine, chef Norman Van Aken is acclaimed for his fusion of Latin, Caribbean, and Asian flavors using traditional European techniques. 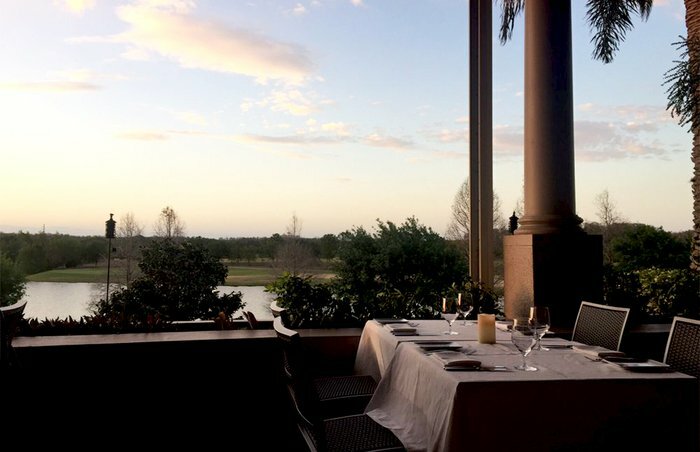 At Norman's in the Ritz-Carlton Orlando, Florida, guests can eat in the opulent dining room or on the restaurant's outdoor terrace overlooking the hotel's lake, the Greg Norman-designed 18-hole golf course, and the lush gardens. 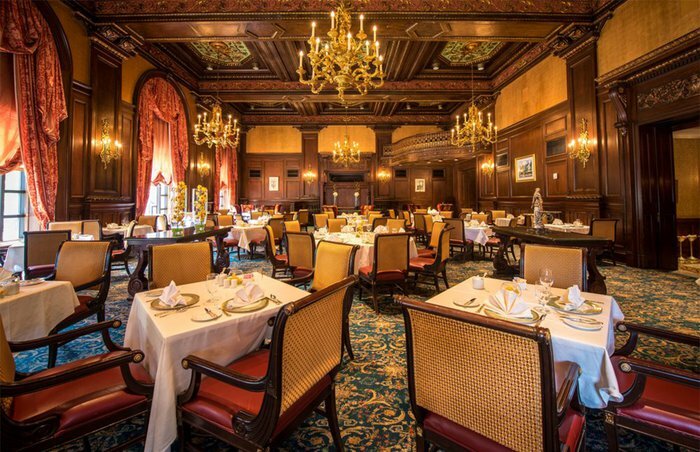 Sit inside and you can enjoy your meal in a large, octagonal dining room with light marble walls and floors, elegant chandeliers and sconces, towering wine displays, and tall arched windows. The menu changes according to availability of seasonal ingredients, but one thing that remains constant is its air of elegance and romance. 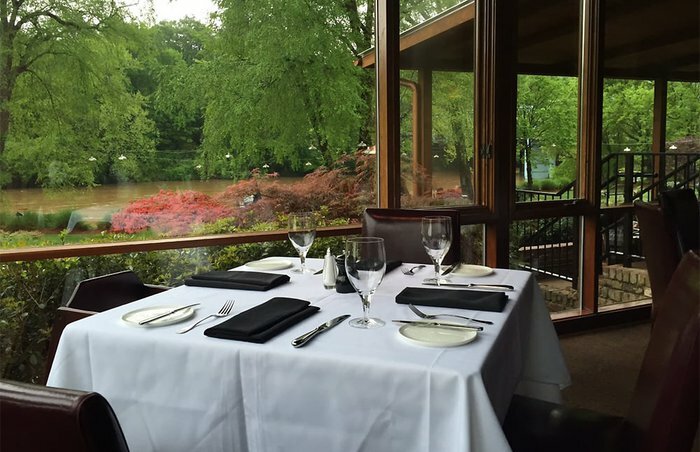 Canoe is nestled in a manicured garden along the banks of the Chattahoochee River, and a peaceful stroll through the grounds is a perfect preamble to a very romantic dinner there. 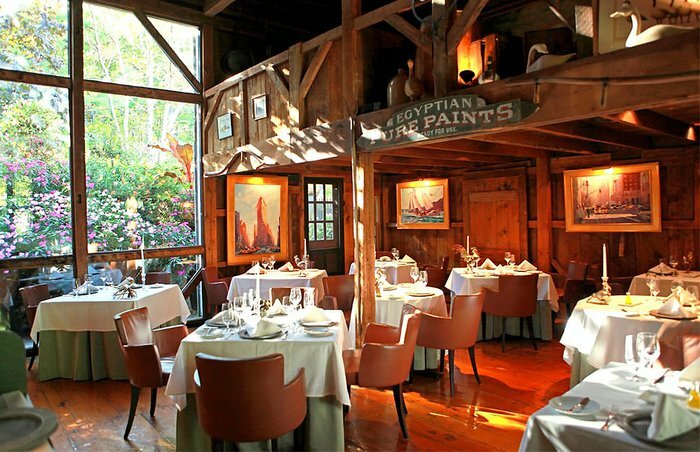 The interior is rustic, warm, and elegant, with plenty of comfortable booths. Once seated, you can enjoy chef Matthew Basford's seasonal Georgia farm-to-table menu of entrées including veal rib-eye au poivre with baby turnip, smoked shank, rapini, and black pepper sauce; brioche-crusted cod with creamed sunchoke risotto and oven-dried tomato pesto; and hand-rolled pappardelle with crimini mushroom, pecorino, braised beef belly, and sherry-mustard cream. Make sure you try the Candy Bar (caramel, marshmallow, almonds, and cocoa nibs) for dessert. 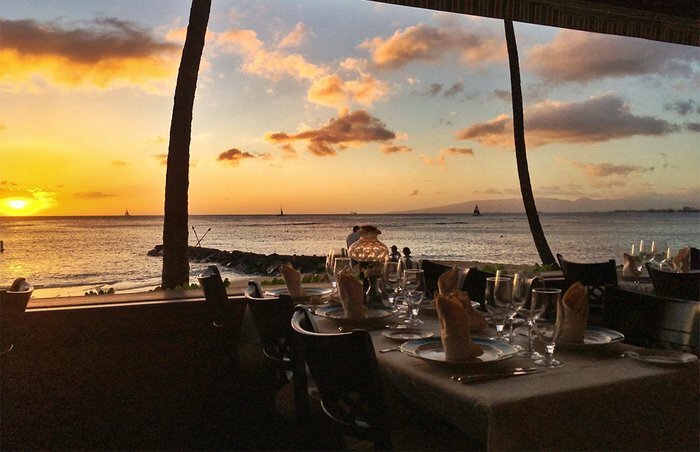 A romantic Hawaii destination since 1962, Michel's is located at the foot of Diamond Head and offers stunning views of the ocean and Waikiki beyond; you can hear the waves lapping at the beach from your table. Listening to the strains of live classical guitar, you can enjoy classic French-inspired fare like lobster bisque (based on a 40-year-old recipe), yellowfin tartare, steamed onaga with local vegetables, filet mignon au poivre, and old-fashioned desserts like cherries jubilee and local bananas with dark rum (both flambéed tableside, of course). The super-romantic Chandlers is an institution in Boise, Idaho, with discreet booths, white tablecloths, and dramatic lighting. It features a stylish martini bar, live jazz nightly, and four varieties of beef: USDA Prime from Chairman's Reserve, natural and organic grass-fed beef from Oregon's Painted Hills, American Kobe from Snake River Farms, and Japanese wagyu. The 8-ounce center cut American Kobe might just be the single best steak you'll find in the state, especially when paired with house-made béarnaise and a side of crazy-good mashed potatoes. 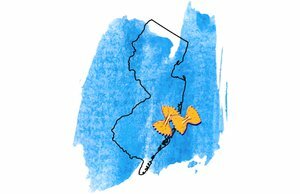 Chandler's also happens to have one of the state's best seafood selections - you just might forget it's landlocked. Located 40 floors up in a building just outside Chicago's iconic elevated Loop, Everest offers one of the finest views in all of Illinois, from a hushed and elegant dining room. As proprietor of this AAA Five Diamond Award recipient, chef Jean Joho offers a seven-course tasting menu (with a vegetarian option); a starter, perhaps, of cold-pressed lobster and potato terrine might be followed by a fillet of wild sturgeon wrapped in prosciutto and a pear soufflé dessert. A massive wine list is available as well. 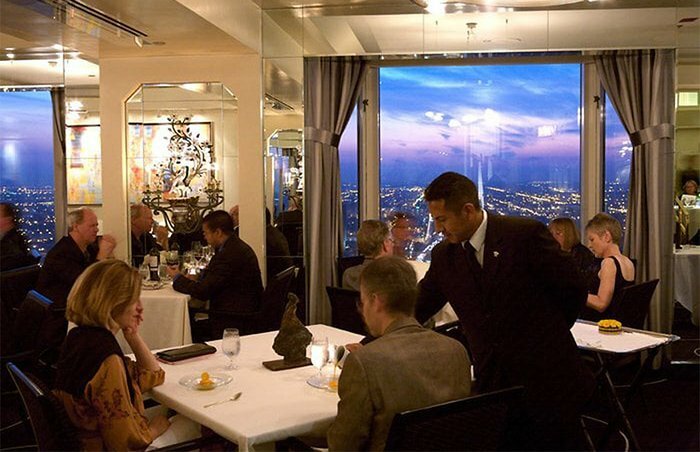 Located on top of Downtown Indianapolis, Indiana's Hyatt Regency, The Eagle's Nest is a fine-dining destination that also happens to be the only revolving restaurant in the city. 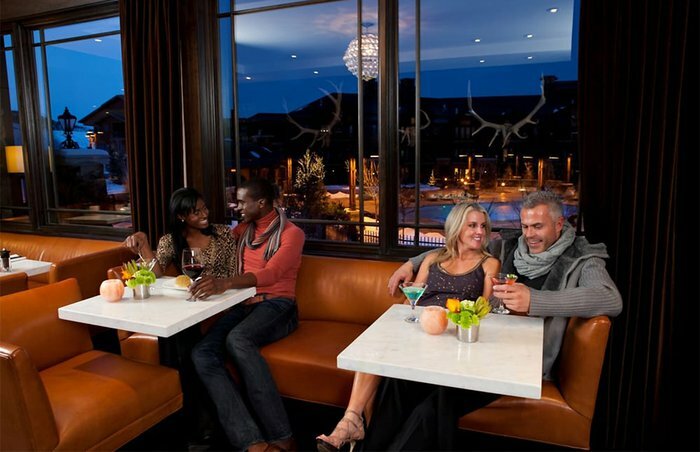 While taking in stunning views of Downtown, you can enjoy dishes like beef cheek and bone marrow with truffle cream, traditional French onion soup, herb-crusted prime rib, pan-seared scallops with Brazilian black rice, and Korean-spiced Colorado lamb chops. 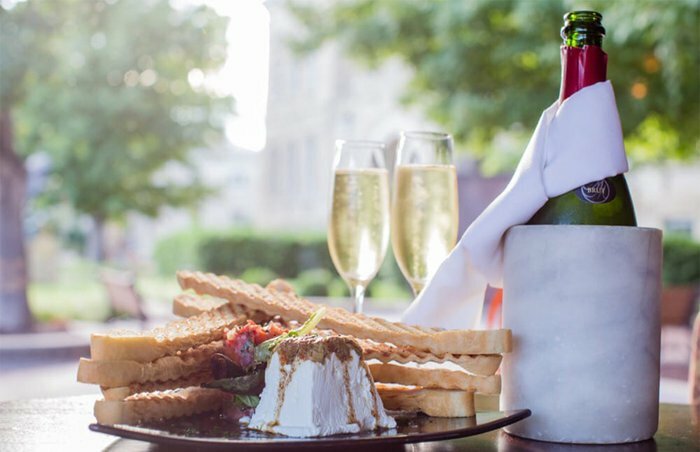 One of Des Moines, Iowa's most acclaimed and upscale restaurants is also the state's most romantic. Centro is located in a former Masonic temple, and today it features an open kitchen, white tablecloths, a long banquette, framed vintage Italian posters, and a winning Italian menu from chef Derek Eidson. 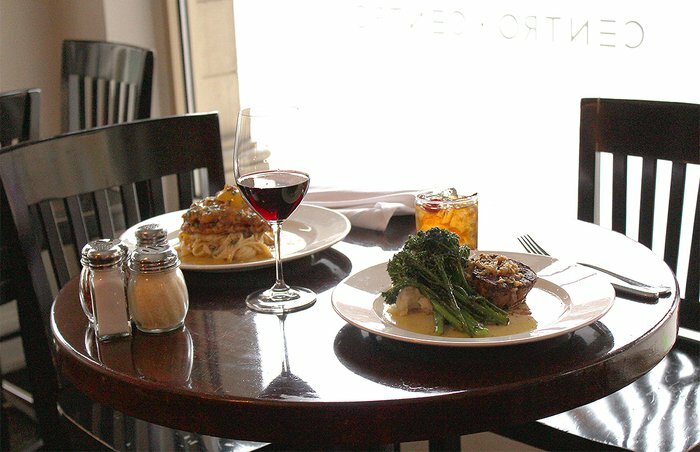 Take your seat, order a nice bottle of wine, and enjoy dishes like pancetta-wrapped shrimp, handmade cavatelli with Italian sausage, chicken saltimbocca, Angus Iowa steaks, and a wide variety of pizzas. An institution inside Manhattan, Kansas' elegant Wareham Hotel, Harry's has an elegant, romantic air highlighted by dark woods, crown moldings, white tablecloths, and a lived-in old-fashioned vibe. Widely regarded as the finest restaurant in town, Harry's menu is chock-full of upscale dishes, like cilantro rum lobster, pinot noir blackberry duck, filet mignon bordelaise, and rack of lamb. Its wine list has also consistently earned awards from Wine Spectator. You may have heard of Louisville, Kentucky's Brown Hotel: It's the birthplace of the city's most famous dish (and one of the most iconic dishes in America), the Kentucky Hot Brown, invented there in 1926. 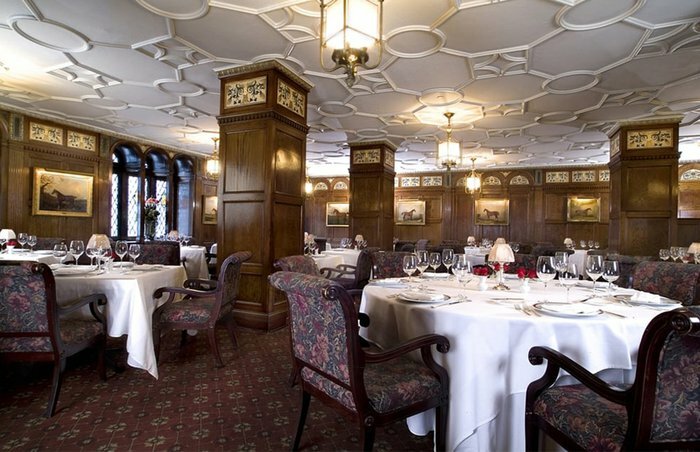 But it's also the city's most elegant hotel, and it's home to the most elegant and romantic dining room in town: the English Grill. Oak-paneled walls, antique lead-glass windows, white tablecloths, high-backed chairs, well-spaced tables, and equestrian paintings give this room an air of refinement. If you'd rather save the Hot Brown (toast points topped with roast turkey, Mornay sauce, bacon, and tomatoes) for another visit, other highlights include shrimp and grits, center-cut prime filet mignon, prime rib-eye Delmonico, and American rack of lamb. It's received the AAA Four Diamond Award, and the wine list is also spectacular. Chef Todd Pulsinelli's menu at the luxurious August, located in a historic 19th-century French-Creole building in New Orleans' Central Business District, shows a great love for, and understanding of, French, Italian, and high-level American cuisine, much of it interpreted with a Louisiana lilt. 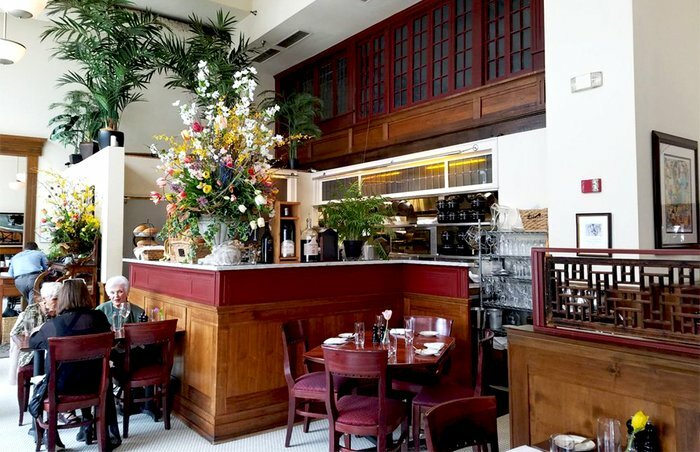 The dining room, with its high ceilings, exposed brick, dim lighting, tall windows, white tablecloths, crystal chandeliers, and spectacular service, is romantic, festive, and elegant, and it's worthy of all the praise it's received over the years. 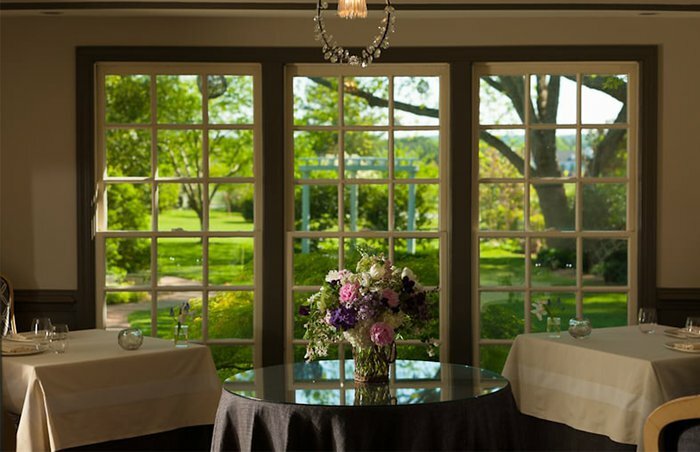 The White Barn Inn is an upscale New England retreat with a AAA Five Diamond rating; its restaurant is housed in a restored 1820s barn with a huge picture window looking out onto nature. The four-course prix fixe menu, new each week, is meticulously presented. Given the coastal Maine location, the spotlight is on seafood, with recent selections including paupiette of Maine sole with lobster raviolo, as well as almond-crusted halibut. However, other choices such as quail or beef tenderloin can also be had; all are good following inventive appetizers like the pomegranate martini sorbet. Open since 1997 in Baltimore, Maryland, restaurateur Tony Foreman and chef Cindy Wolf's Charleston has been the go-to destination for well-to-do Baltimoreans looking to celebrate a special occasion for more than two decades. Drawing on both French and South Carolina Lowcountry influences, the restaurant offers a prix fixe menu of three to six courses of dishes like cornmeal-fried oysters with lemon-cayenne mayonnaise and Upland cress; shrimp and grits with tasso ham, andouille, and Anson Mills grits; sweetbreads en cocotte with seared foie gras, oyster mushrooms, macaroni, and cognac cream; and grilled French quail with pecan stuffing, Vidalia onion beignets, and banyuls reduction. Each menu item has a corresponding wine pairing; we suggest you take them up on their offer. 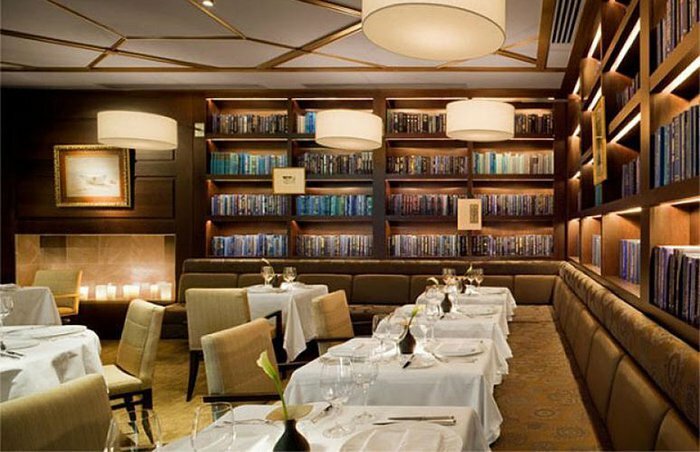 At L'Espalier, the most upscale and romantic restaurant in Boston, Massachusetts, chef Frank McClelland serves a variety of tasting menus that draw on French influences to turn New England-sourced ingredients into truly luxurious creations. After taking a seat in one of the three romantic dining rooms (each of the four rooms have their own unique design scheme), you'll be treated to dishes including game bird terrine with beets, green peppers, and onion brûlée; Pineland Farms roasted beef tenderloin with chanterelles, Brussels sprouts, and new potatoes; poached gray sole with toasted hazelnuts, endive, and grapes; and roasted duck with Sauternes-poached raisins, Turkish figs, Puy lentils, and foie gras. 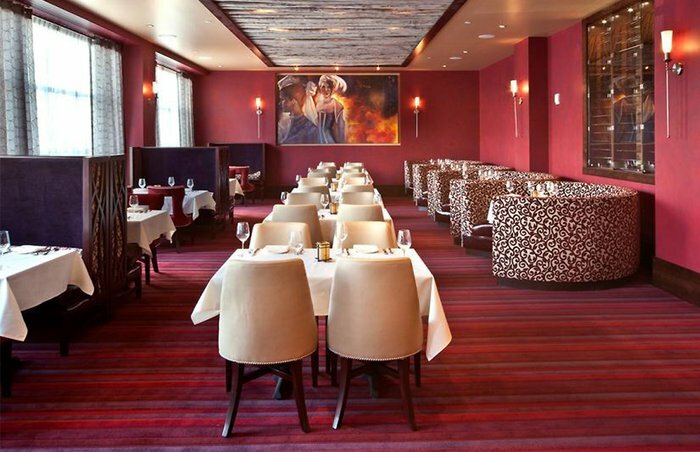 A sparkling 16th-floor restaurant inside the MotorCity Casino Hotel, Iridescence is the only AAA Four Diamond restaurant in Detroit, Michigan, and it wears the distinction well. 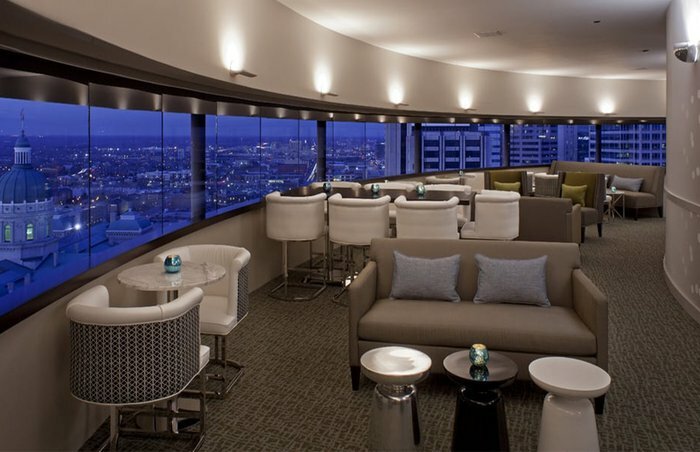 With its super-high ceilings, modernist décor, deep blue lighting, amazing views, and comfortable seating, Iridescence is, well, iridescent, and an ideal date spot. Its menu is also upscale and lavish, with items like broiled oysters, Alaskan king crab on brioche, 48-hour short rib with a sweet corn and cheddar tamale, elk shank potage, Hawaiian opah, A-5 Kobe strip loin, and Niman Ranch steaks. End your meal with a Melting Chocolate Sphere or boozy baba au rhum, and don't miss the award-winning wine list. 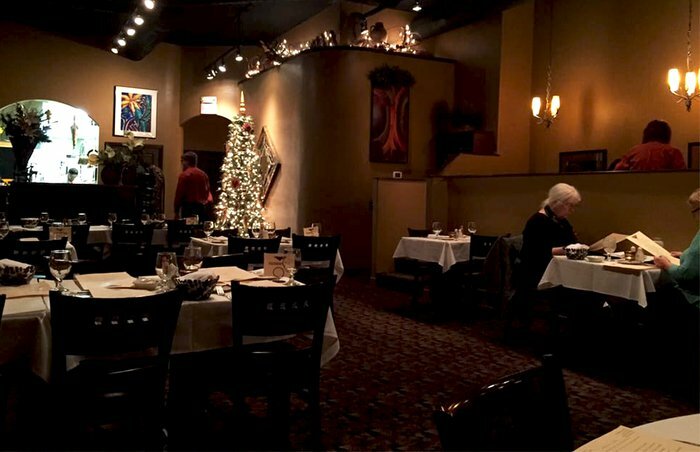 One of the finest French restaurants in Minnesota, Meritage is a nearly perfect bistro with a warm, bustling, and undoubtedly romantic dining room. 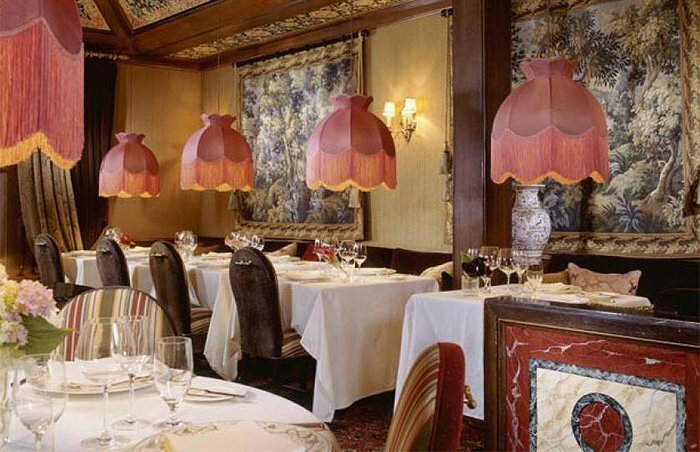 Start your meal at the curved zinc bar and settle into a comfortable banquette for a meal of foie gras crème puffs, a shellfish platter, onion soup, moules frites, and steak frites with some of the best french fries you'll ever try. Going strong for more than 50 years, Mary Mahoney's is a classic New Orleans-inspired restaurant housed in a Mississippi house that dates back to 1737. 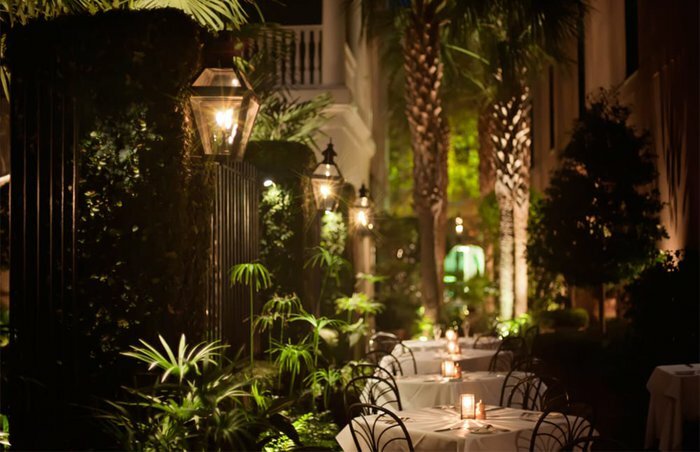 Sit in the romantic courtyard surrounded by old brick and below the hanging vines of a live oak, or take a seat in one of the several cozy dining rooms, and treat yourself (and your date) to classic Southern fare like shrimp remoulade, fried soft-shell crabs, seafood gumbo, stuffed flounder, prime rib au jus, or the signature half lobster Giorgio (lobster and shrimp in a brandy cream sauce). Located in a century-old Benton Park building and run by chef Kevin Nashan and his wife and brother, Sidney Street Café is a unique, stylish, and utterly romantic Missouri restaurant. 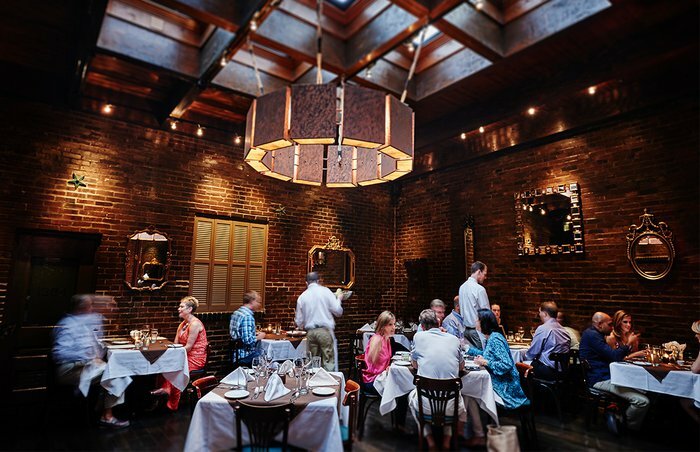 Surrounded by old brick walls, with a dark wood plank floor and a ceiling dominated by large skylights, the restaurant offers a menu of creative Southern-inspired fare to diners sitting at well-spaced tables with white tablecloths. Standout menu items include lobster turnovers with tomato brandy reduction, house-made charcuterie, rabbit porchetta with wild mushroom ragout and cheesy grits, roasted scallops with shellfish chowder, and lobster-stuffed filet mignon béarnaise. A chef's tasting can also be prepared upon request. 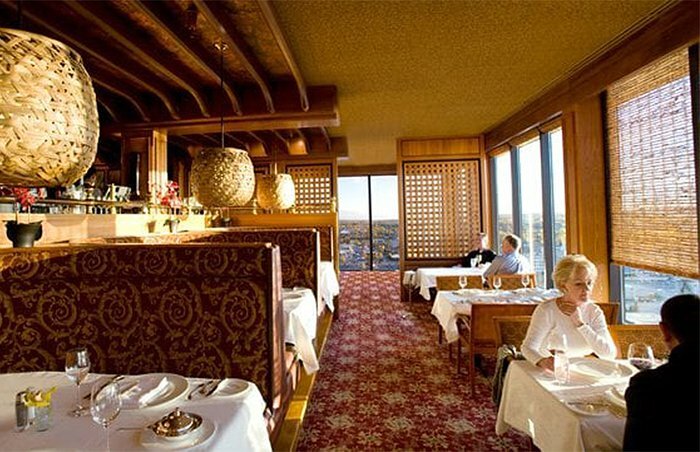 The white tablecloth Ten, located in the Northern Hotel in Billings, Montana, is a destination for locals looking for a romantic meal. Chef Nick Steen's menu puts local ingredients to good (and creative) use in dishes like Montana-raised veal porterhouse with pesto couscous, sun-dried tomato cream, artichoke hearts, fried onion, and bourbon barrel-aged sherry vinegar; milk braised pork shoulder with caramelized cabbage, local rye berries, and walnut gremolata; and local trout with white beans, Spanish chorizo, pickled peppers, and romesco. One of Nebraska's great culinary standouts, The Grey Plume has a relatively no-frills, high-ceilinged dining room with dark reclaimed-wood floors, white tablecloths, original art on the walls, a small floral arrangement on each table, and an upscale, refined, and romantic atmosphere. Chef/owner Clayton Chapman's menu is seasonally driven and primarily sourced from local produce and livestock; current offerings include steelhead trout gravlax, house-made buttermilk agnolotti, a tasting of local Heritage pork, and Morgan Ranch wagyu collar or strip loin. A four-, five-, or eight-course tasting menu is also available. Forty varieties of fresh fish are flown in daily from Italian coastal waters and served whole at Costa di Mare, located inside Las Vegas' opulent The Wynn, and it's easily one of the best seafood restaurants in the country, if not the best. It's also the most romantic restaurant in Nevada. 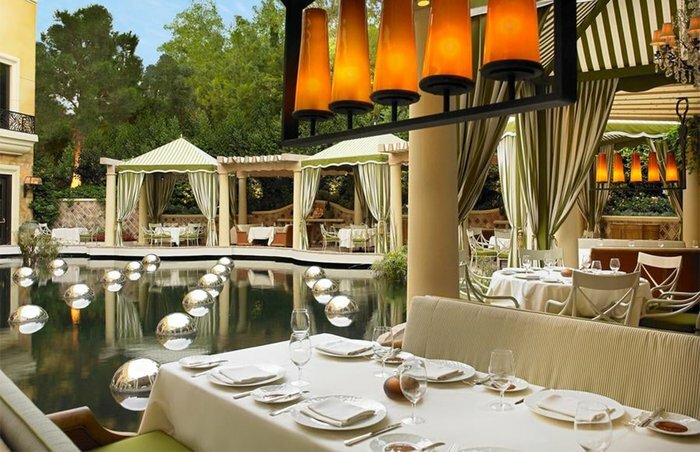 With its lush greenery and large lagoon, the outdoor seating makes it feel as if you're dining in the Tuscan countryside, and the modern and stylish interior is unique, very chic, and super-romantic. To dial the romance up a few notches, request a table in a lagoon-side cabana. 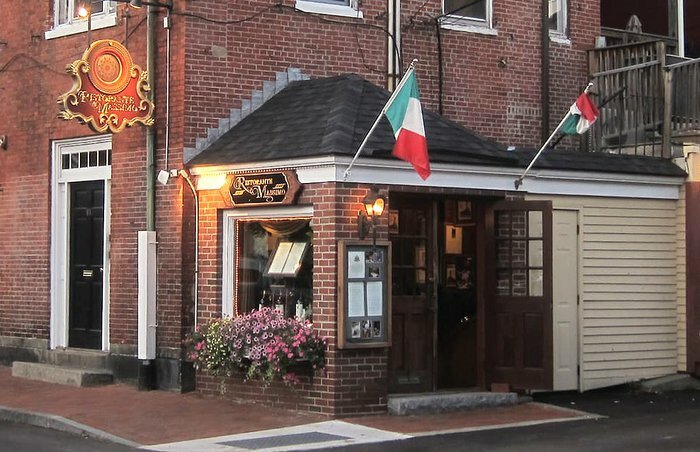 In a quaint brick building in historic seaside Portsmouth, New Hampshire, Ristorante Massimo offers warm and intimate seating among artwork and stone walls. Upscale without stiff formality, the accommodating staff - owner Massimo personally greets each patron - ensures a welcoming experience. The kitchen puts its own stamp on Italian dishes; diners might choose entrées such as pan-roasted halibut over fennel and grilled scallion purée, or Gnocconi alla Loichle, cracked pepper dumplings with beef tenderloin. The new upstairs bar is a great place for pre-dinner drinks and small plates. 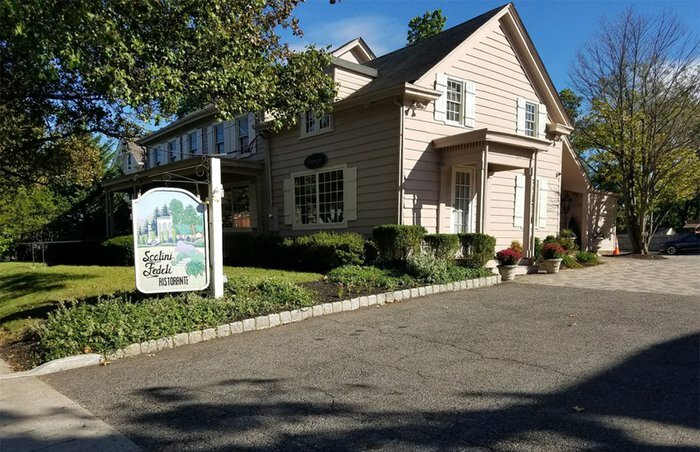 Located inside a New Jersey farmhouse dating from the mid-1700s, the elegant and inviting Scalini Fedeli is entering its 24th year, still under the helm of founding chef Michael Cetrulo. With the white tablecloths, high vaulted ceilings, and antique pine floors, just setting foot inside the restaurant sets the stage for a romantic meal. Cetrulo's menu fuses French and Italian and all dishes are elegantly plated and served with just the right amount of fanfare. 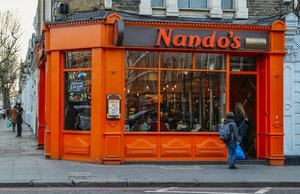 This restaurant was so successful that it spawned a New York City location in 2000, which is still going strong. 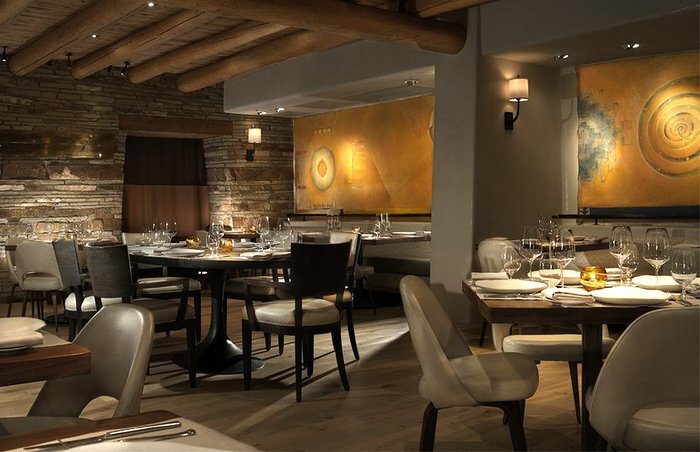 The luxurious and upscale Rosewood Inn of the Anasazi in Santa Fe, New Mexico, is home to the city's most romantic eatery, The Anasazi Restaurant. Chef Edgar Beas sources much of his menu from 13 different local farms, and the end result is a quintessential New Mexican dining experience. The menu is constantly changing, but sample menu items include duck breast with smoked corn pudding, summer squash, and husk cherry; pork belly with Anasazi bean, huitlacoche, wilted chard, and pork jus; and dry-aged prime strip loin, local mushrooms, kohlrabi, onion marmalade, and fingerling potato. High-profile organo-loca-sustainavore Dan Barber has found the perfect home at Blue Hill at Stone Barns, a beautiful restaurant in a bucolic but hardworking setting on the year-round farm and educational nonprofit center Stone Barns Center for Food and Agriculture in a tiny New York hamlet called Pocantico Hills, established by David Rockefeller as a memorial to his wife. This literal farm-to-table restaurant prepares reserved meals based largely on the day's harvest, served in a gorgeous and minimalist dining room with a vaulted ceiling, reclaimed wood floors, cream-colored walls, plenty of windows, well-spaced tables, hanging plants, and (of course) white tablecloths. The serene and upscale dining room, the high-end cuisine, and the pastoral setting combine to create one of the most romantic dining experiences in America. Open since 1980 inside the legendarily luxurious Fearrington House Inn just outside Chapel Hill, North Carolina, the elegant Fearrington House Restaurant offers four different menus, ranging between three and eight courses. The menus change regularly, as nearly every ingredient is either sourced from the property or from nearby farms and gardens, and they're served in a series of intimate dining rooms inside an old farmhouse. Expect dishes like house-cured bacon with heirloom carrot, pistachio, Medjool date, and granola; black truffle agnolotti with walnut, Rainier cherry, chanterelle, and Madeira; and veal tenderloin with foie gras, truffle, celeriac, and nori from chef Colin Bedford, with an expertly curated wine and cocktail selection. Be sure to end your meal with the legendary hot chocolate soufflé. 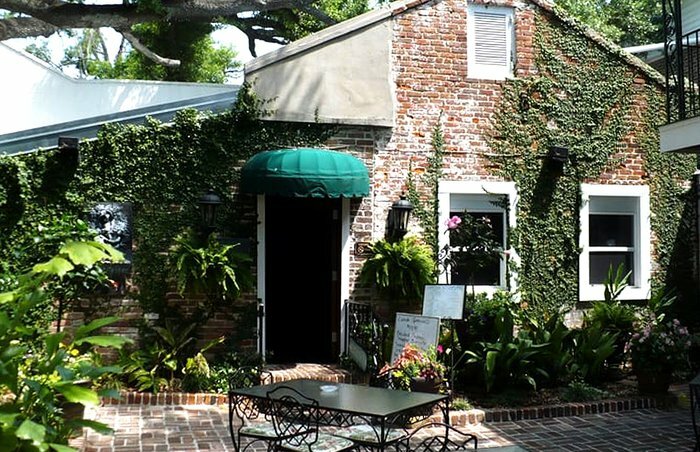 Since 2005, Pirogue Grill owners Stuart and Cheryl Tracy have sourced high-end local ingredients and served them in a classy, brick-walled, white-tablecloth dining room. The end result? One of the most popular and romantic restaurants in North Dakota. Local walleye, bison, lamb, and venison sausage are always on the menu, but other seasonal specialties include barbecue rabbit on a wild rice potato pancake, free-range chicken breast stuffed with smoked cheddar and apple slaw, grilled lamb loin chops with chokeberry and mint sauce, and filet mignon with roast corn and black peppercorn sauce. Michael Symon's flagship restaurant Lola is a true Ohio gem; it's here where the Iron Chef really displays his culinary prowess via dishes like beef cheek pierogis with mushrooms and horseradish and creme fraiche; bacon-wrapped sturgeon with creamed spinach, parsnips, and apples; smoked pork chop with chiles, polenta, and barbecue onions, and house-made charcuterie. The dining room itself is also insanely romantic, with dim indirect lighting, nicely-spaced tables, plenty of cozy booths, white tablecloths, and a relaxed and elegant atmosphere. Make sure you end your meal with pastry chef Summer Genetti's chocolate hazelnut roll with roasted banana ice cream and passion fruit. Located inside a circa-1930s Oklahoma flower shop and still retaining much of its original historical detail, Cheever's Café has become a local institution since it opened in 2000. 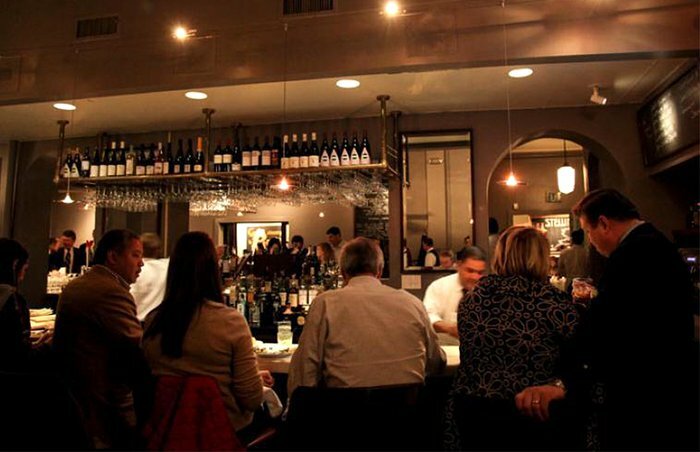 It's famous for its creative spins on traditional Southern fare like Benton's country ham carbonara, chicken fried steak with jalapeño cream gravy, tortilla-crusted Alaskan halibut, and local grass-fed bison strip steak, but it's also renowned for its reputation as the most romantic restaurant in town. The brick walls and ceiling beams are exposed, large windows let in plenty of light, there's ample outdoor seating, and of course there are white tablecloths. The brunch is also pretty spectacular. 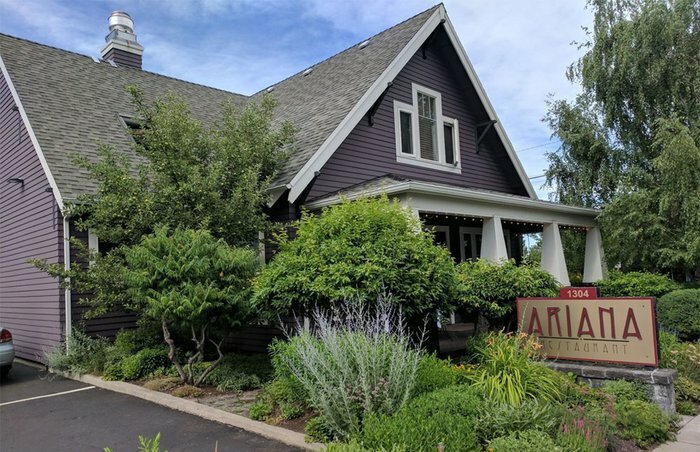 Located inside a craftsman-style bungalow on Bend's west side that was originally a private home, Ariana is run by chefs Andres and Ariana Fernandez and has been going strong since 2004. 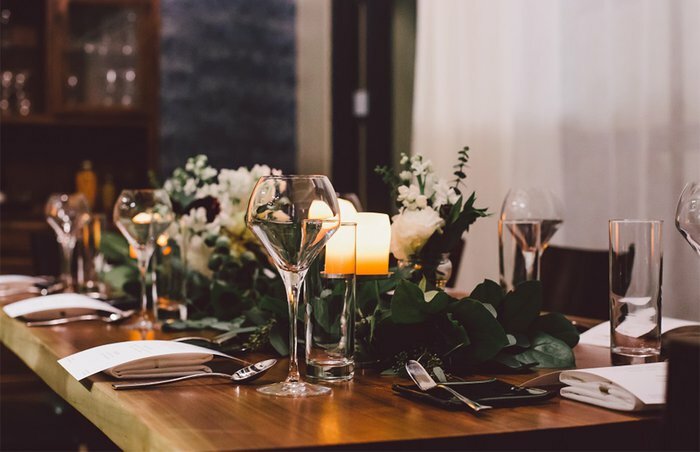 It showcases Central Oregon's culinary bounty in dishes like wild Petrale sole with charred broccoli and fried white yams, braised rabbit with guanciale and roasted local sunchokes, and filet mignon with wild Oregon mushroom purée. But if you're making it a romantic evening, we suggest you opt for the five-course chef's tasting menu from your seat inside the homey, comfortable dining room, where you'll find large, well-spaced tables, a fireplace, big windows, and dim, romantic lighting. 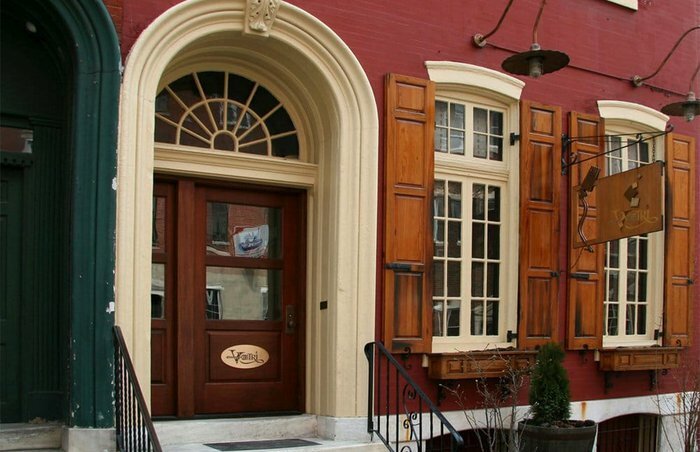 Chef Marc Vetri's 21-year-old Philadelphia, Pennsylvania, flagship, Vetri Cucina offers diners sophisticated, hand-crafted Italian and Italianate specialties, served only in the form of six-course tasting menus in a cozy and romantic townhouse. Available items are listed under antipasti, pasta, secondi, and dolce (dessert); chef de cuisine Matt Buehler will personalize the menu to your taste. You might end up with, for instance, roasted cauliflower with bagna cauda, lumache with duck ragù, guinea hen with seasonal mushrooms, and chocolate polenta soufflé for dessert. All is served with precision and grace, and there is a wine cellar of more than 2,500 bottles to choose from. The exclusive Rhode Island enclave of Newport is home to countless beautiful inns and mansions, and the Castle Hill Inn has been one of its loveliest hotels since it opened in 1875. Its main dining room (called, appropriately, The Dining Room), is a stately and elegant chamber offering stunning views of the ocean through floor-to-ceiling windows. The remaining décor is primarily made of light wood paneling and understated and elegant fixtures. 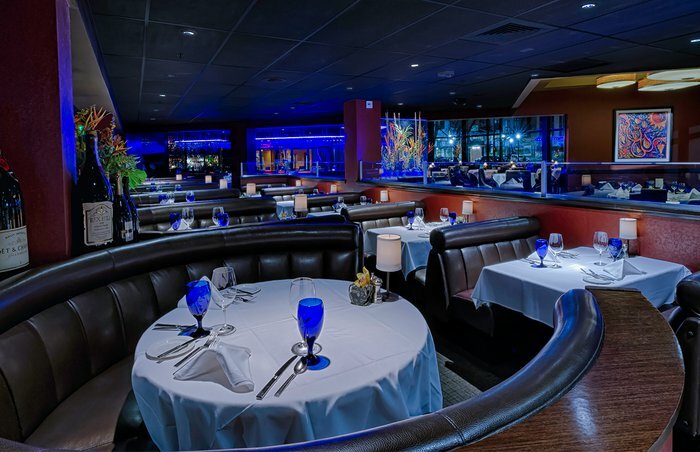 Located right in the heart of Charleston, Peninsula Grill is a renowned upscale restaurant that's the perfect date night spot. The romance begins before you even walk through the front door: All guests walk through a garden path just to enter (garden seating is also available on nice days). Once inside, the dining room is bustling but elegant, with gray walls and large white tablecloth-topped tables, chandeliers, and portraits and equestrian paintings on the walls. 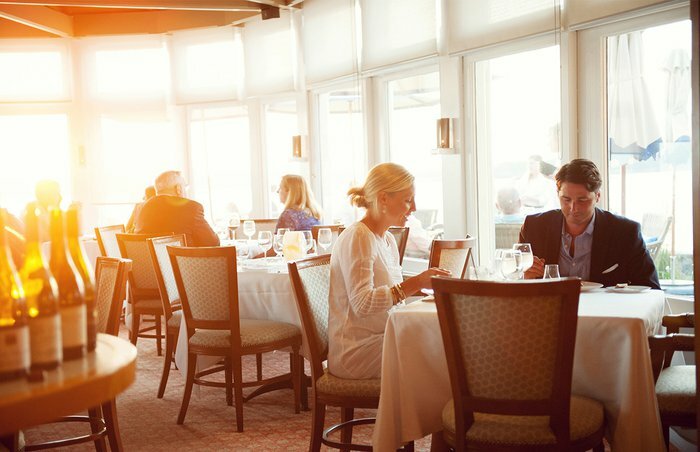 Highlights from the sophisticated South Carolina-influenced menu include she-crab soup, roasted domestic lamb porterhouse, pan-roasted local trout, and some of the city's finest steaks. Minerva's today has nine restaurants in South Dakota, Iowa, and Michigan, but the original Sioux Falls location, dating back to 1977, is the one to visit. 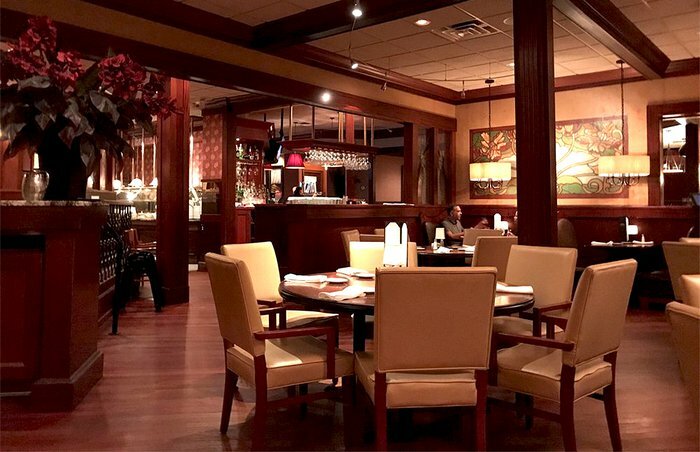 With white tablecloths, dark woods, dim lighting, and spacious booths, it's a comfortable and inviting place to linger over a celebratory meal with a hand-cut steak, roasted duck, Dakota buffalo burger, breaded Canadian walleye, or the famous crab artichoke bake. 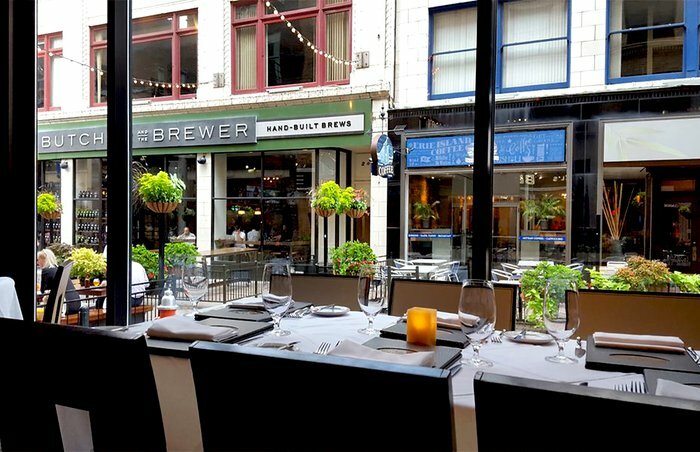 The wine list is varied and affordable, and there's outdoor seating in the summer. 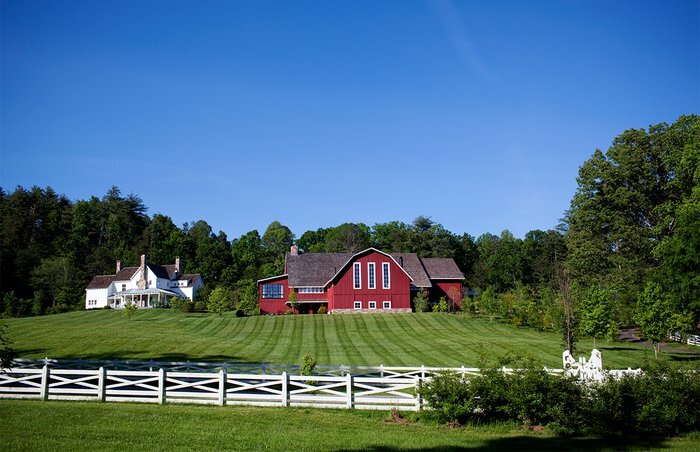 The cuisine at The Barn at Blackberry Farm in Walland, Tennessee, is so influential that it has inspired a new category: Foothills Cuisine (the foothills being those of the Smoky Mountains). The dining room here is about as upscale and romantic as it gets, with antique linens, custom chairs, sterling silver, and a jackets-required policy. If ever there was an appropriate use of the term "farm-to-table," this is it: The estate's produce and products go into a dynamic menu of Smoky Mountain regional dishes with global flair like Springer Mountain Chicken with Carolina Gold rice grits, broccolini, and roasted mushrooms; apple and duck heart salad with hop vinaigrette, candied pecans, creme fraiche, and sage; and hearth-roasted celery root with parsnip, cippolini onions, and mushrooms. 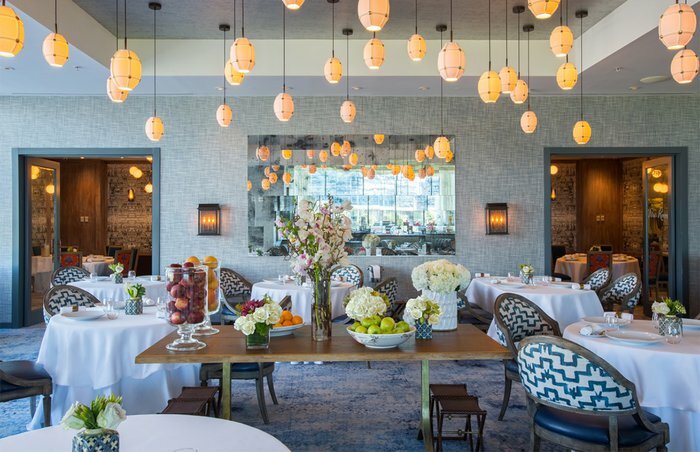 The classy and upscale Houston fine dining destination Chateau, a formal dining room located upstairs from more casual eateries at the multi-part concept La Table, is gleaming, fancy, and undoubtedly romantic Texas destination. 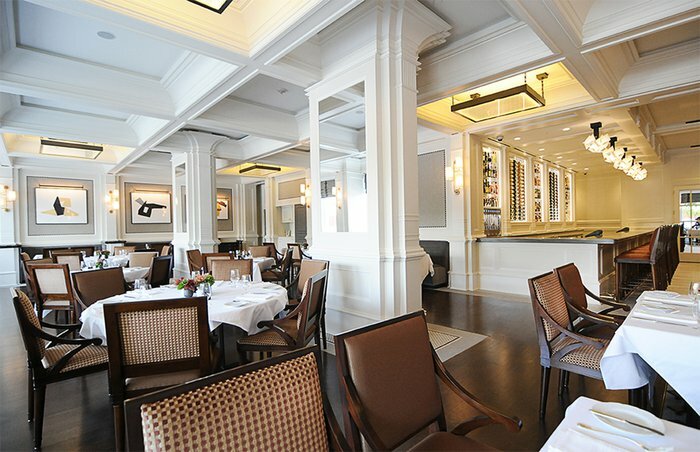 This bright and spacious culinary gem is filled with light during the day, and at night, the gray walls, light woods, and modern lighting combine for irresistible romantic appeal, complemented by classic French dishes like gougères, French onion soup, steak frites, and caramelized cheese soufflé. Located inside Park City, Utah's luxurious Waldorf Astoria, Powder is relaxed yet upscale, with reclaimed wood floors, dim lighting, and large windows overlooking the hotel's courtyard. Chef Michael Zachman's menu highlights local, seasonal ingredients in dishes like pappardelle with rabbit ragout, wild mushrooms, truffle jus, and Parmesan snow; local venison with yam purée, baby carrots, wilted kale, and thyme veal jus; guajillo-rubbed bison tenderloin with winter succotash, beetroot purée, and huckleberry jus; and foraged mushroom pot pie with celery root, truffles, and Gruyère veloute. 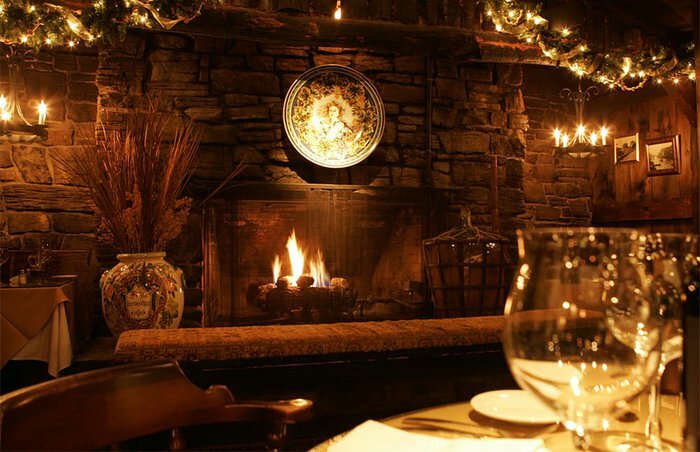 The most romantic restaurant in Burlington, Vermont, the 26-year-old Trattoria Delia occupies a charming basement space and warms the cold night with a fireplace, a super-cozy vibe, and traditional regional Italian fare. It's been going strong since 1993, and all pastas are either hand-rolled and cut or made using an Arcobaleno extruder with traditional Italian brass dies. So we definitely suggest you sample some pasta dishes - the chitarra all'Amatriciana (with house-cured guanciale) and tagliatelle al terre e mare (with local scallops and porcini mushrooms) are standouts - but entrées like prosciutto-wrapped Vermont rabbit and slow-braised short rib are also spectacular. Make sure you sample the house-made gelato for dessert. Self-taught chef Patrick O'Connell opened this Virginia restaurant, about an hour's drive from D.C., in 1978, and it's ornate, eclectic, and luxuriously romantic. He formed alliances with local farmers and artisanal producers long before it was fashionable, and developed into a sophisticated modern American chef of the highest order. 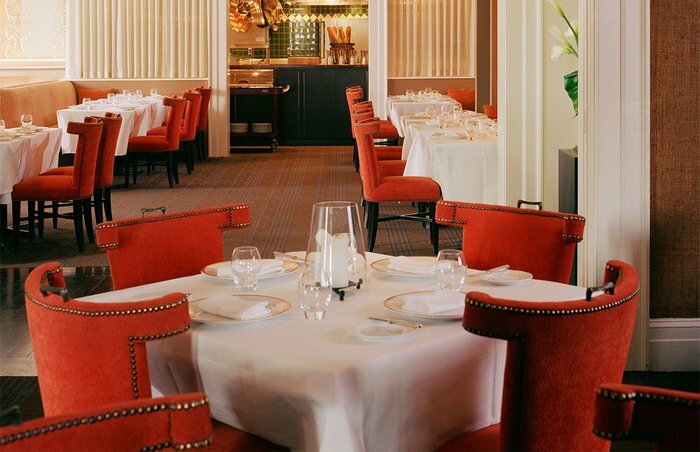 Menu items at The Inn at Little Washington might include classics like American osetra caviar with peekytoe crab and cucumber rillettes, napoleon of chilled Maine lobster with pommes Anna, and veal "Shenandoah" (prosciutto-wrapped loin with country ham ravioli and fontina). The Inn, a member of the Relais & Châteaux group, has a much-deserved AAA Five Diamond rating. 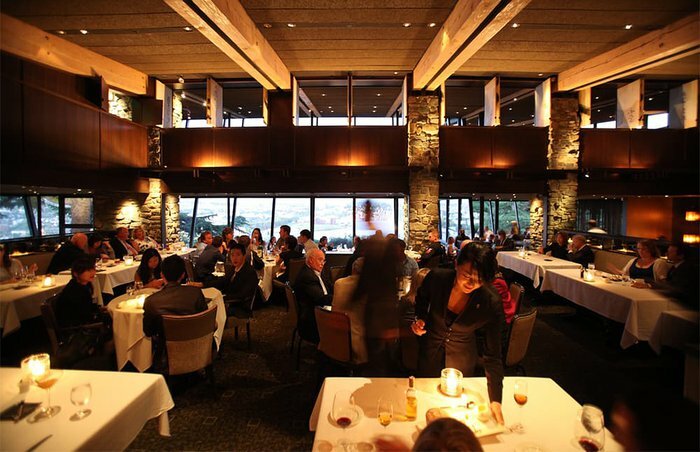 Canlis is a true Pacific Northwest landmark. It's been open in Seattle, Washington, since 1950, serving fresh, seasonal dishes that are more polished than cutting-edge in a rustic-modern space whose use of native wood and stone evokes forests and streams. Canlis was revolutionary when it opened due to its stunning architecture (Roland Terry and Pete Wimberley collaborated on an original design meant to echo Frank Lloyd Wright) and trailblazing menu of upscale Northwest cuisine (which founder Peter Canlis essentially invented), and it's still blazing new trails while keeping the classics, such as the famous Canlis salad (romaine, bacon, mint, oregano, and Romano with a dressing of lemon, olive oil, and coddled egg), on the menu. Jackets are required, and the soaring dining room, with its white tablecloths, well-spaced tables, and air of luxury, is the height of Seattle fine dining. Washington, D.C.'s graceful Jefferson Hotel houses Plume, offering diners Old World ambience in a plush, nook-filled, super-romantic setting - complete with a fireplace - and inventive cuisine. The restaurant's seasonal menu takes its inspiration, in part, from the produce in the kitchen gardens at Thomas Jefferson's Monticello home in nearby Charlottesville, Virginia. The pavé of striped bass with marinated beets, carrot emulsion, and bordelaise sauce is just one creative meal example; that might be topped off with a praline parfait dessert with pineapple and date chutney and caramel vanilla foam. 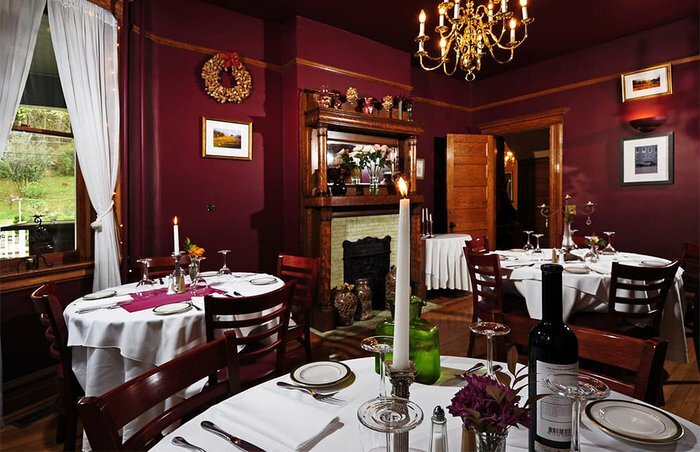 Located inside a West Virginia country estate dating back to 1989, Café Cimino Country Inn is home to a charming bed and breakfast as well as the state's most romantic restaurant. The small restaurant is just a handful of well-spaced tables draped with long white tablecloths and topped with flowers and candles, in a homey chandeliered dining room with wine bottles stored along one wall and a curving row of windows along another. Before or after your meal of linguine with clam sauce, pan-seared filet mignon, sea scallops and prosciutto, and sticky toffee pudding cake, be sure to stroll the grounds along the Elk River. 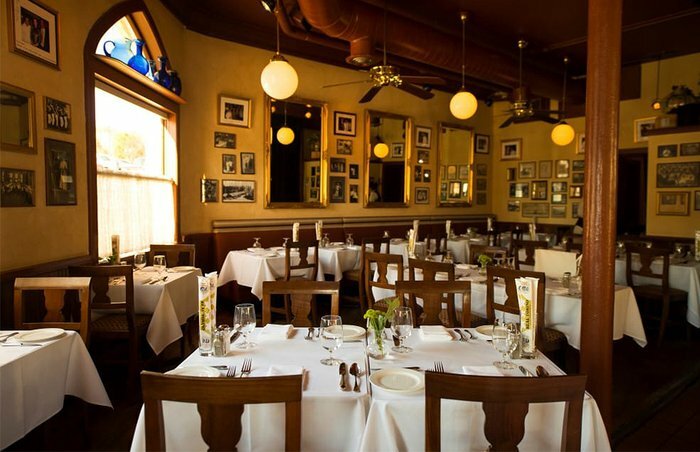 Renowned chef Paul Bartolotta's flagship Italian restaurant, Ristorante Bartolotta, is located on the outskirts of Milwaukee, Wisconsin, and it's been drawing guests from downtown for more than 20 years. The dining room is rustic and elegant, with white tablecloths, old photos on the walls, and an air of relaxed sophistication. A must-order is the Uovo in Ravioli (a single large raviolo encasing ricotta, spinach, and a whole runny egg yolk). Other standouts include hand-cut pappardelle with slow-braised duck ragù, a half chicken roasted under a brick, and whatever is on the chef's three-course seasonal menu. Located at the foot of Wyoming's breathtaking Grand Tetons, the Jenny Lake Lodge is an upscale AAA Four Diamond resort hiding inside a series of rustic-looking 1930s-era log cabins. Inside, however, it's all sumptuous elegance (even though the log cabin vibe certainly carries over into the interior design). There are plenty of dining options on the property, but the crown jewel is called simply The Dining Room. Upscale and elegant, it boasts a five-course prix fixe dinner menu that changes nightly depending on what's fresh, local, and in-season. 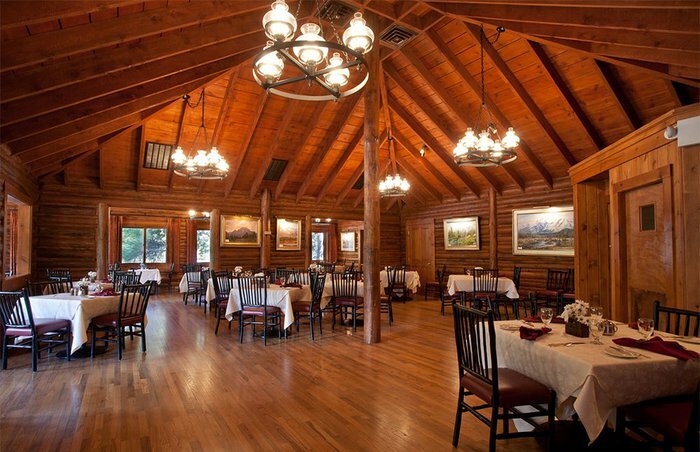 Open annually from June to early October, it boasts high timbered ceilings, plenty of windows, large tables spaced far apart and topped with white tablecloths and flowers, and a rustic log cabin vibe. 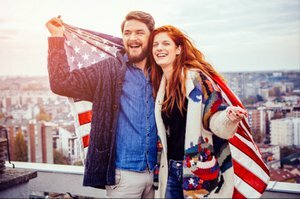 And if dinner isn't your thing, consider taking your love to the best date spot in every state.